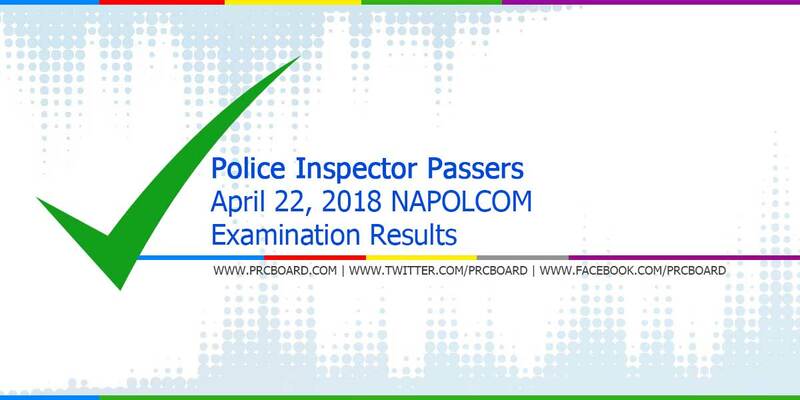 MANILA, Philippines - The April 2018 NAPOLCOM exam result and list of passers for Police Inspector promotional exams will be available at this website as soon as the National Police Commission officially released the results online approximately three (3) months after the date of examination. Results of promotional examinations for other positions as well as top 20 examinees are also posted. Below is the complete list of passers for April 2018 Police Inspector promotional exams, courtesy of NAPOLCOM. [To be updated as soon as NAPOLCOM issues official results...] The entrance and promotional examinations are administered by NAPOLCOM on April 22, 2018 at designated regional testing centers around the country. Police Inspector exam result April 22, 2018 please..